Billy says, "Feed me...and maybe my kitty cat too"
If breaking bread with The Smashing Pumpkins' Billy Corgan is your idea of mealtime heaven, then you just might be in luck: CharityBuzz.com is offering lunch with Corgan, and you still have time to win. What does it cost to dine with the head Smashing Pumpkin, you might ask? As of this writing, bidding is up to $950, with the next bid set at $1,050 (bidding increases in increments of $100). 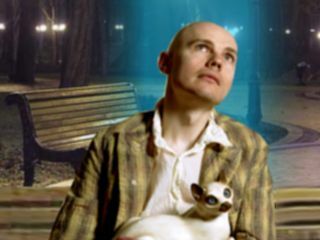 CharityBuzz.com notes that since bidding opened on 4 June, eight fans have pledged their hard-earned greenbacks to hang on Corgan's each and every word over lunch. Or maybe they just want to see if he chews with his mouth open - who knows? The lucky winner of Lunch With Corgan can choose to dine in Los Angeles or Chicago, with the meal set at a mutually convenient time. The exact restaurant is up for grabs - and since Billy isn't paying (you have to foot the bill for the food too, lucky! ), perhaps Subway isn't a bad way to go. The auction benefits the Songwriters Hall Of Fame. According to CharityBuzz.com, one of the organization's goals is "to establish a permanent, state-of-the-art museum in New York City to highlight the achievements of songwriting greats and acknowledge their rightful place in our culture. "The facility will also serve as a resource and center of study for scholars, aspiring songwriters, students and music lovers young and old to learn about our musical heritage." Sounds decent enough. And hey, maybe Corgan will be generous and buy you dessert and coffee. After all, The Smashing Pumpkins have sold a few records in their time..
Bidding ends 30 June at 1:17pm EST, so break open that piggy bank and get on the case.